Lewis Rice is pleased to announce that Kirk A. Damman was named as a top patent attorney in St. Louis Small Business Monthly's (SBM's) Best in Business edition. 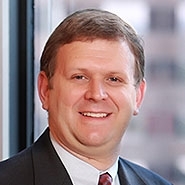 Kirk is one of only 10 St. Louis patent lawyers to receive this award. The Best in Business issue is compiled from insights and feedback from SBM's readers and is a resource to the St. Louis business community to understand and connect with the best service providers in the area. St. Louis SBM is a locally owned business publication, bringing business tips, strategies, and analysis to top executives of 17,000 businesses in the St. Louis metropolitan area. Kirk practices in all areas of intellectual property law, with an emphasis on helping startup and growing companies begin to manage, license, and gain value from their intellectual property (patents, trademarks, copyrights, and trade secrets) as well as obtain protection for their most important ideas and products. With a degree in physics and licensed to practice before the U.S. Patent and Trademark Office for more than 10 years, Kirk works with clients whose products are as diverse as circuit and electrical designs, medical devices, computer software and Internet, heavy equipment and manufacturing, alternative energy and fuel, and consumer goods.